One of the topics that brings the most comments on our Facebook page at Guns and Lace is Ammo availability and cost. Not much else except an anti-gun politician brings out more of an emotional response. I do not know about you, but I am not a happy camper if denied the ammo I want... I mean NEED, to shoot the center out of the target I am working on! So, I've been on the hunt for some answers to affordable shooting and finding a rifle that one can actually buy ammo for. My friends, here is the answer to the second most asked question I get. (the first one, if you are wondering, is are you married?!). The other is always about how can you go shooting, given the current scarcity and cost of ammo? The Waffen AK74, has the look and feel of an AK47, but is chambered in 5.45x39 instead of 7.62×39. The difference in cost of which is that ammo for the AK74 at the time of this writing is about 2/3 the cost of the AK47. 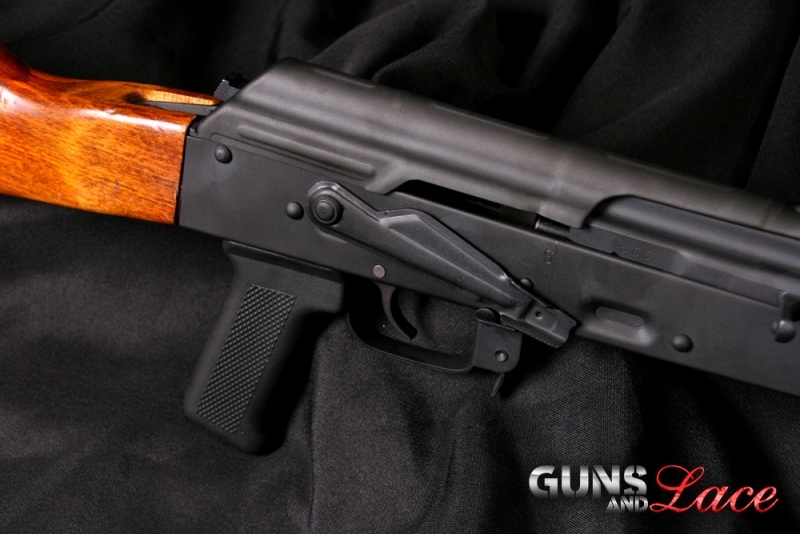 The receiver is Bulgarian, the stock surplus wood, U.S. parts are the barrel, trigger group, and pistol grip. The Tapco mag also adds three U.S. parts to make it legal. Not only is the Waffen AK74 fun to shoot due to its roar and recoil, it is one very accurate rifle in the hands of a proficient woman shooter, (you men will just have to fare for yourselves, as I am writing this review as a woman, from my perspective ). 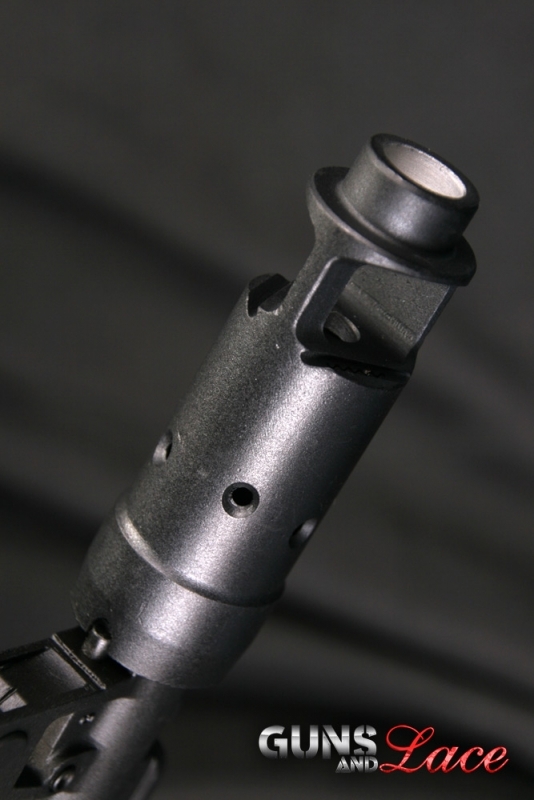 With 1-3 inch MOA , many reports state that the AK74 accuracy is better than a standard AK 47 due to a flatter trajectory. If you have shot an AK47 you'll feel like you have an old friend in your arms with the AK74, everything looks and feels the same, the traditional Eastern Europe safety, trigger pull, sights and balance are the same! Reliability, you ask? 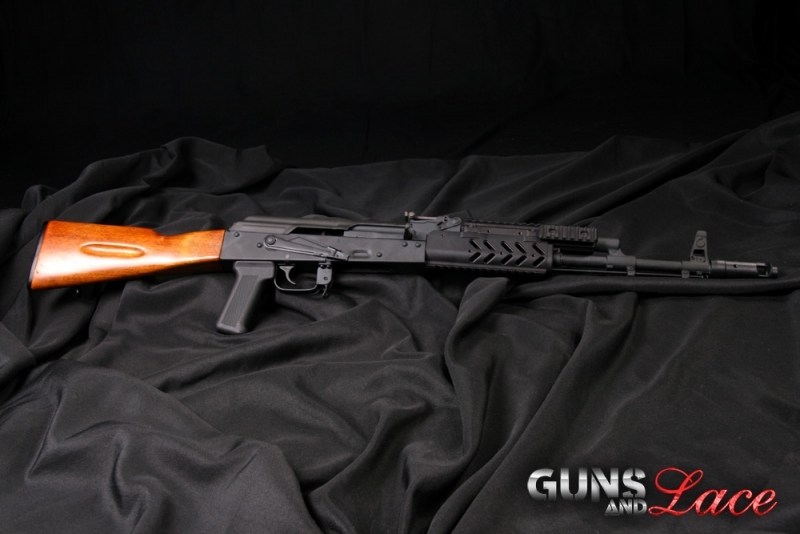 The AK74 eats military surplus ammo for breakfast, jam free, no matter what we threw at it. This rifle is a bit lighter than a traditional AK47, and if you are carrying it any distance, it is not an unwelcome feature. Waffen Werks does a nice job, with a reasonable fit and finish, at a price that won't break the bank, but best of all the ammo for it is still, and has been, readily available at about half to two-thirds the price of AK47 ammo. I do not know about you girls (and guys) but I love a good bargain! Don't kid yourself, the price of a firearm is soon forgotten, the cost of ammo, well that goes on and on! Get your can opener ready boys, we bought two tins of military surplus online, during the worst ammo shortage on record, each tin containing 1080 rounds for about $235.00 per can, plus shipping. We had no trouble finding it online with a simple search in stock and ready to ship. I'll have a grande, skinny, split shot, iced mocha, with a dash of peppermint syrup, please. Megan not only can lay a mean wall of lead down range, obliterating a target, this girl makes coffee drinks that would have your average chemist swooning! When Megan is not out camping, horseback riding, or hitting the logging trails on her ATV, you'll find her at work at the local drive through espresso/coffee stand. It's no wonder with Megan working as a coffee barrista, the stand she works at has seen revenue go up and just about every contractor and sub-contractor within 20 miles lined up in their trucks to have her make coffee for them in the morning. Megan is from a little woodsy town, just on the outskirts and East of the city of Seattle, the woods are full of deer, the air is clean, water runs in the streams and the stars are beautiful at night. Though she loves driving a pick up truck and tending the horses on her place, she is just as comfortable in the city dancing to the beat of the latest band, be it country or rock! When it comes to handguns, her favorite is the Kimber Solo Carry, if that doesn't have you kickin' your heels up and yellin' Yee-Haw, I do not know what will! Her favorite quote is from Marilyn Monroe... "Well behaved women rarely make history!"